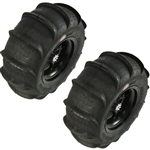 Searching for the best UTV sand tires and wheels? Our sand dune packages ensure that any UTV will be able to whip through the dunes and beaches with ease. All of our sand tires and wheels are designed with excellent flotation and deep treads, enabling your UTV to turn smoothly at fast speeds on sandy surfaces. Make your trips to the dunes or the beach the best experience ever when you have the proper UTV sand tires from Adrenaline-Junkee.